Normally when talking about 2013 Allen & Ginter Baseball, hearing the word odd used to describe something pulled from the product is not odd at all. The set has become very popular based on its eclectic and outside-the-box take on a baseball card product and Topps has experimented with many different themes for various inserts and hits. 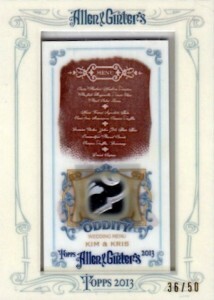 A&G took it a step further this year by including the word odd in an actual insert. 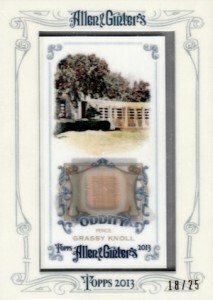 As the card back reads, "This genuine Topps Allen & Ginter relic card features an odd or unique collectible." 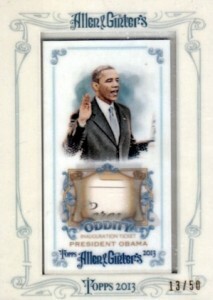 These Oddity Relics are already catching the attention of collectors based on their rarity and historical significance. The small checklist is not as much odd individually, as it is odd in the combination of the four cards. 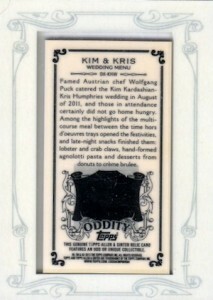 Relics from the Grassy Knoll of John F. Kennedy infamy, Wrigley Field and President Barack Obama's Inauguration are joined by Kim Kardashian and Kris Humphries' wedding menu. So there are relics associated with two presidents, a piece of one of the most famous sports venues in the world, and Kim Kardashian. Odd, indeed. The cards are found at a rate of 1:7,150 packs, but they were not produced in equal numbers. 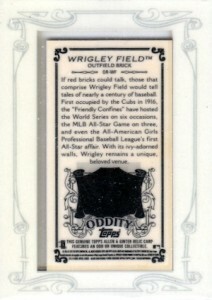 The print run of the Wrigley Flied relic is equal to the print run of the other three cards combined. Despite this, the first Wrigley Field relic sold for $68 and the President Obama relics are attracting a lot of attention. The checklist and images can be viewed below. 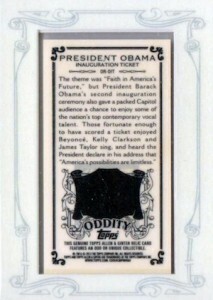 The particular relic included in the card is also noted, as well as the print run. There is some speculation that if you buy this product directly from the Topps online retailer the chances (in lieu of the word odds, it seemed too wrong to say it that way) are statistically higher then if you purchase them from the hobby store. Do you, or has this topic been overheard, feel that there is some truth to this? Basicly I am aware that for instance “retail” packages have a lower chance of redeeming some of the hardest to find cards as well as lower chances of pulling signatures ect. I was told that retail cards can be returned to the company after time and on the other hand “Hobby” retailers are required to own the products purchased. This resulting in better chances for a hobby shop to have the odds in favor of better cards. When the hobby shop has a better idea of what a customer is getting from the boxes as they are more likely to tell the owner were as major chain stores would be less likely to ever hear or relay that information if they did it leaves a void in statistics not only on the large chain stores but online as well. Does anyone have an opinion on this topic. I thought it may fit well with the “Odd” cards? I am having an extremely difficult time identifying a particular card. 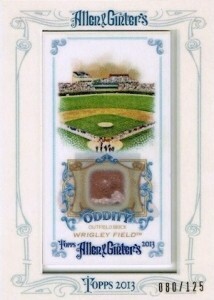 It appears to be a Topps Allen & Ginter’s mini relic card … but it has no year or card number. The front identifies it as a “Genuine Hair Strand” of John F. Kennedy … but the reverse side is blank brown cardstock. This mini card is floating inside a larger blue frame, enclosed on each side by a sheet of plastic. ANY information about this card would be appreciated. If you provide an email address, I can provide photos of the card. 2013 Topps ALLEN & GINTER Hobby Box FACTORY SEALED 3 HITS per box - MACHADO?